Our Physicians | North Central Eye Associates, Inc.
Dr. Kerry Allen is the Chief of Surgery at Fisher-Titus Medical Center. He specializes in ophthalmic and oculoplastic procedures: eye surgery. His focused areas of surgical expertise include: no-shot/no stitch cataract surgery with premium lens implants including RESTOR, CHRYSTALENS and TECHNIS, laser surgical procedures for glaucoma, macular degeneration and diabetic retinopathy, aesthetic and reconstructive ocuplastic surgery, pediatric strabismus surgery and Botox injections for functional and aesthetic purposes. 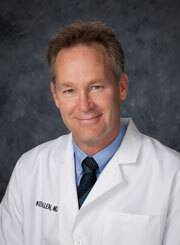 Kerry M. Allen M.D. has practiced at North Central Eye for over 20 years. Dr. Allen received his undergraduate degree in Biology from the University of New Mexico, then on to post-graduate studies in Biochemistry and graduated from the University Of New Mexico School Of Medicine earning a Doctor of Medicine degree. Dr. Allen trained in Internal Medicine at the University of Arizona before completing the residency program in Ophthalmology at the Cleveland Clinic. In addition to his position as Chief of Surgery at Fisher-Titus Medical Center for over 10 years, Dr Allen is a former president of the Huron County Medical Society, former Chief of Staff at Fisher-Titus Medical Center, longstanding delegate to the American Medical Association Organized Medical Staff section representing the Fisher-Titus Medical Center physician staff, delegate to the Ohio State Medical Association representing the Huron County Medical Society, a fellow in the American Academy of Ophthalmology, board certified by the American Board of Ophthalmology, a member of the Ohio State Medical Association, a member of the Huron County Medical Society, a member of the Ohio Ophthalmology Society and a member of the Pan American Society of Ophthalmology. Dr. Allen provides consultative ophthalmic services to all of the physicians, optometrists and patients of Huron county, Erie county, Richland county, Lorain county, Sandusky county Ohio including: Norwalk, Willard, Plymouth, Shelby, Mansfield, New London, New Washington, Attica, Wellington, Wakeman, Vermillion, Huron, Milan, Sandusky, Port Clinton, Castalia, Bellvue, Monroeville, Berlin Heights, New London and North Fairfield. In the Ohio region, Dr. Jonathan Zahler is one of the few physicians fellowship-trained in premium and complex cataract surgery, laser vision correction, corneal surgery, and external diseases. In addition to specializing in these challenging conditions, Dr. Zahler provides care for the entire eye, for the entire family. As a comprehensive ophthalmologist, he performs family eye care, premium cataract surgery, macular degeneration management, glaucoma control, diabetes evaluation, provides optical services, contact lens fitting and much more. After graduating at the top of his class from the Philadelphia College of Osteopathic Medicine, Dr. Zahler performed a dually accredited medicine internship at Lankenau Hospital in Philadelphia, PA. He then completed his ophthalmology residency training at PCOM, where he was named Chief Resident. During his residency, Dr. Zahler was the recipient of the prestigious Patrick M. Murray award given by the AOCOO to residents in training who demonstrate "professional proficiency, unusual merit, and skills in the practice of ophthalmology." Upon completion of his residency, Dr. Zahler accepted a fellowship in anterior segment, cornea, trauma, and refractive surgery. At the highly renowned Wills Eye Institute, a worldwide leading training institution, Dr. Zahler performed numerous cornea/refractive surgeries including cornea transplants (DALK, DSEK/DSAEK, penetrating keratoplasty), trauma reconstruction, Lasik, and PRK. 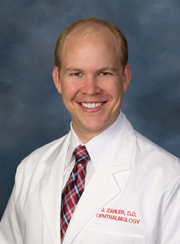 Dr. Zahler is a comprehensive local ophthalmologist who provides compassionate eye care with an academic university-trained skill set that makes him a unique ophthalmologist for our region. He has been published with leaders in the eye field and presented research at international meetings. Through the latest technology, he provides minimally invasive, no pain premium lens cataract surgery, Lasik, PRK, corneal transplants, glaucoma surgery, lasers for both glaucoma and diabetes management, and intravitreal injections for disease such as macular degeneration.